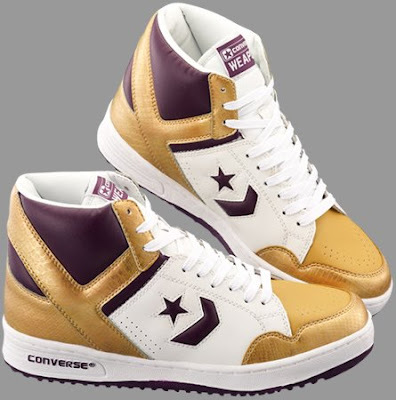 The Converse Blog: The Converse Blog's Weapon Wednesday: Japan Snake Skin Lakers Weapns. 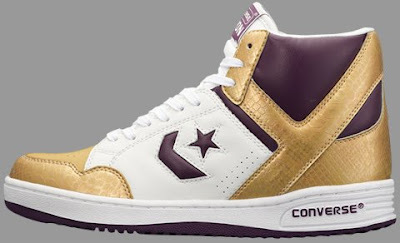 The Converse Blog's Weapon Wednesday: Japan Snake Skin Lakers Weapns. Here is an interesting twist on an all-time Classic Converse. The Lakers colorway of the Weapons is seen below. However, the gold portions of the shoe have been replaced with a Gold Faux-Snakeskin pattern. This results in a darker gold and purple colorway of this Weapon. Sadly, these are only dropping in Japan. Well that's all for today's Weapon Wednesday. Don't forget to weapresent your opinion and vote in the poll on your way out. Thanks for checking out the blog! Maaaaaaaaaan, those are a thing of beauty. we are french journalists, and we would like to make an historical graphic showing the important moments of converse. Stars who wear converse, like Kurt Cobain, chuck Taylor, etc. And also the moments of crisis, etc. could help us giving some elements or some books or some internet links to make this funny and crazy project succeed?